Wolverton Works to be demolished by 2020 – will it also bring the end of the Royal Train? Wolverton Works, the World’s oldest longest continually open standard gauge railway works is to be demolished within the next four to five years. The decision was made at a Milton Keynes Council Planning meeting on 17 November amidst some controversy when considering the St Modwen, Works’ owners, application. This was because following a local planning referendum 18 months ago, Wolverton’s residents overwhelmingly voted to retain the buildings in any redevelopment. The whole Works forms part of a Conservation area, thought to be one of the UK’s largest as it includes a huge railway-built housing estate for Works’ employees. Historic England refused to ‘list’ the buildings saying that they were already protected. Planning Conditions attached to the decision also breached more planning policies with only 10% affordable housing and a below par Section 106 planning gain fund demanded. The Works in its heyday a century ago, employed over 5000 people and was the very reason for Wolverton’s existence. It was built to service the World’s first long distance intercity line, the London to Birmingham Railway, who chose the greenfield site to locate their main Works in around 1836 because it was roughly half-way between London and Birmingham. It was also adjacent to the Grand Union Canal making it easier for building materials to be brought to site and ironically started the demise of the canal’s fortunes as railways transported goods. The Works was also heavily involved in three war efforts, the Boer War and both World Wars. It built General Haig’s train and ambulance trains as well as repairing planes in WW2. After British Rail ownership, Wolverton Works was bought in 2001 by Alstom to carry out acceptance and reliability modifications to their new train fleets such as the Pendolinos. When this work was complete, the French train builders sold the Works to the property developers St Modwen who leased the works to Railcare. They in turn entered administration in July 2013, just weeks before the 175th anniversary. In September 2013, the Administrators sold the business to Knorr-Bremse, (KB) but only after half the 250 strong workforce had been made redundant. Since then, KB has quadrupled the workforce on the strength of a five year lease, which expires in 2018. The latest projects there include manufacturing Crossrail platform screens, in a refurbished workshop, and replacing every external Pendolino door. A new contract re-engineering Class 321 electric trains for Voith is about to commence bringing the overhead cranes back into use in the Lifting Shop. Other workshops have been modernised and include a new carriage corrosion treatment unit while the traversers have been brought back into full use following electronic control panel upgrades. A new staff car park has been created near the Royal Train Shed. The Royal Train has been constructed and based at Wolverton since 1869 and is now likely to be relocating after 150 years there. The existing Royal Train Shed was built in 1988 and will also be demolished to make way for housing overlooking the canal. Some of the Royal Train staff now fear that the train will no longer operate if relocated from Wolverton but if it carries on, it is understood that Derby could be the new home – but the train may be retired and enter preservation. Milton Keynes will be celebrating its 50th anniversary in under eight weeks time. The Council is looking to celebrate this throughout 2017 using the town’s heritage but curiously agreed to lose most of it! But the debate seemed to centre on the Council’s squeezed finances and the need to try and catch up on their housing targets set by Government. Andrew MacLean, Head Curator of the National Railway Museum sent a statement to the planning meeting emphasising just how important Wolverton Works was to UK history, but to no avail. St. Modwen said that the £100m Wolverton Works regeneration plans will support hundreds of current and future rail-related jobs for the town and deliver much-needed new homes and community facilities for Wolverton. In September, planning was approved for the construction of a Lidl store in an early phase of St. Modwen’s wider masterplan and construction will commence in spring 2017. Further planning applications will be brought forward in due course, to determine the exact designs of the new buildings. In April, St Modwen wrote to Phil Marsh they would not get involved in the War Memorial and that it was for Knorr-Bremse to attend to. This was included into the planning application at the last minute to help garner votes. St Modwen also still says that only 300 jobs are at The Works. It is in fact around 480, Knorr-Bremse’s figures. Initially, there was to be provision for a Heritage Centre either. Network Rail has confirmed it is looking at the future of the Royal Train. St Modwen also said that safeguarding jobs could only be achieved by demolishing the Works and building a new one. Nick Brailey, Communications Manager for Knorr-Bremse told Phil Marsh in February 2016 that they would ot be relocating if they had to remain in the existing buildings. Whatever the pressures on the Council brought by St Modwen and Knorr-Bremse behind the scenes, it emerged in the planning meeting that Knorr-Bremse had not yet told St Modwen their requirements for a new Works. Once this has been established, a detailed planning application will be submitted for approval and no demolition will take place until all Approvals have been obtained. This will take up to two years. The development will be delivered in phases to avoid business interruption to Knorr-Bremse. Once the foodstore has been built, phase two will see Knorr Bremse move to the west of the site say St Modwen ( where they already work ) and a new premises can be built for them. The final phase will be the new homes, and what is described as ‘potentially’ a community/ heritage centre and public spaces on the west part of the site in around 3-5 years’ time. One key point which the Council, Knorr-Bremse and St Modwen are all silent on is the provision of a level crossing for HGV’s to access the site. It is known that the Office of Rail and Road do not sanction any new level crossings but as the new one will be inside the Works curtilage, it will be the Health & Safety Executive that approve it or otherwise. This was brought up at the Planning meeting by a local councillor but ignored by the rest of the meeting. This also ignored locally agreed planning policies and any protection afforded by being inside a Conservation Area. Progress can be followed at www.wolvertonworksonline.co.uk . Just as had happened in the 1914-1918 War. Wolverton Works was requisitioned for more important work than building railway carriages. Technology and engineering had moved on over 20 years and greater skills were required of Wolverton workers. Carpenters shaped and framed the wings for Horsa gliders and repaired the wings of Hawker Typhoons. Machinists built gun sights and parts or tanks, including the large tank wheels, something the works could easily adapt to. Woodworkers shaped rifle butts. Larger projects included the building of Bailey Bridges. These bridges, named after their designer, came in component parts which could be transported and assemble quickly over streams and rivers. Wolverton also built over 8,000 assault landing craft for the D Day invasion. The Horsa gliders, shown in this photograph, were built for D Day to carry men and equipment across the Channel. They were substantial aircraft with a wing span of 67 feet, Some concept of the scale is shown here. They were towed into the air by airplanes. The craft was named after the 5th century Saxon invader Horsa. 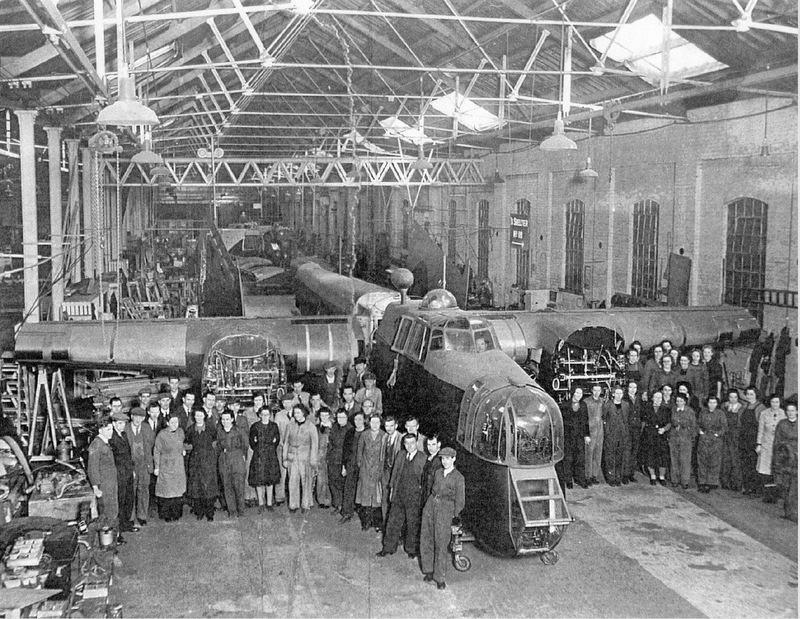 This last photograph show men and women who worked on the repair of a Whitley bomber. 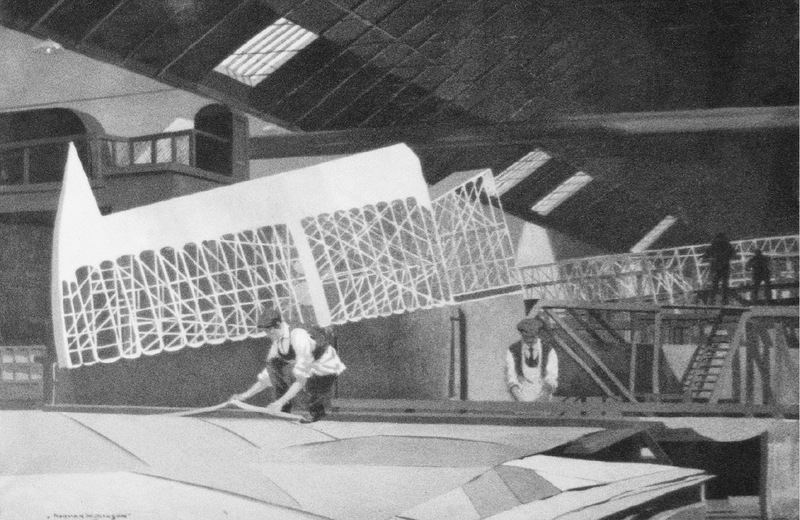 The wings have been cut (presumably to be reassembled later) to allow the huge aircraft into the narrow workshop designed only for railway carriage manufacture. A number of women in the photograph are in overalls, presumably doing mechanical work. Such an idea may not have been imagined in pre-war years. These photographs are on display at the Milton Keynes Museum. They were probably taken circa 1943-4, prior to the D-Day invasion of France. These plans here give some detail about the growth of the railway and Wolverton Town itself in the first 25 years. 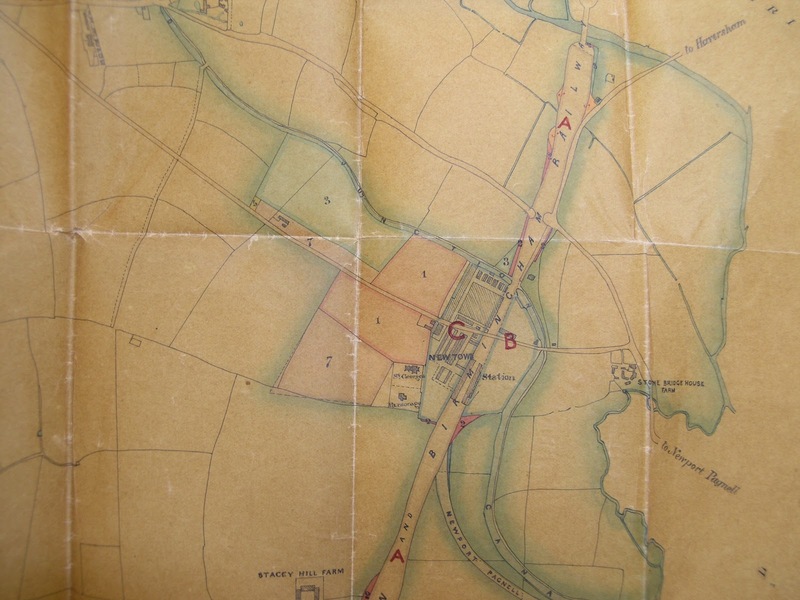 The section marked AA was the original purchase, essentially just the line itself because there was no firm intention to build workshops at Wolverton. 27 acres in 1837, one year before the completion of the railway. Section B was an 8 acre parcel which was for the workshop and some housing. The B is not accurately placed on this map as it is really the part north of the Stratford Road. No more land was made available by the Trust until 1858 when the strip that you would recognise as Church Street and the Stratford Road was purchased. Building started here in 1860. At the same time more land was purchased north of the Stratford Road for workshop expansion. It was about this time that some of the early northern cottages were demolished to connect the workshops. 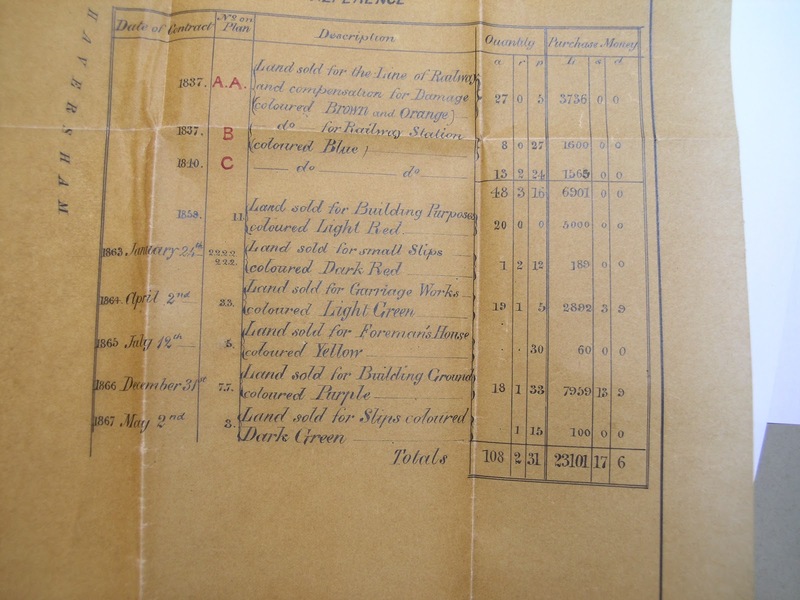 At the end of 1866 the Company purchased another field which was to become Buckingham Street, Aylesbury Street, The Square, Radcliffe Street, Bedford Street and Oxford Street. I am intrigued by the little yellow square at the western end of the new railway works land which is designated “Foreman’s House”. I have looked through the 1871 Census but can find no reference there, so I wonder if it was ever built? After yesterday’s post about the downgrading of the Carriage Works in 1962, I reproduce this assessment of Wolverton from Edgar and John Larkin’s book The Railway Workshops of Britain 1823-1986. In 1962, following the rationalisation of all the main works, Wolverton ceased manufacturing new carriages, except saloons for the royal train. Wolverton’s record for building specially fitted coaches is unrivalled. The most impressive have been for heads of state, and the greatest variety in coach construction is shown in the royal trains of several generations. The longest continuous story is that of the British Royal Family, whose first saloons were produced in the 1840s. These coaches, from various railway companies, reflected contemporary fashions, and appropriately some are preserved at the National Railway Museum, York. Queen Victoria’s 1869 saloon, built at Wolverton, consisted of two six-wheelers connected by a bellows gangway, the first example in Europe of such a feature. The coaches built for King Edward VII’s train of 1903 used the best of traditional crafts­manship, but Queen Elizabeth II’s 1961 saloon incorporated the fashions of the period of its construction, just as its air-conditioned 100 m.p.h. successor reflected those of the 1970s. The Queen has visited Wolverton Works on several occasions. One such visit was on 17 December 1976, when she went to inspect the new royal train, comprising eight refurbished inter-city coaches built in 1972 as prototypes for the 125 m.p.h. High Speed Trains, and two new royal saloons, No. 2903 for the Queen and No. 2904 for the Duke of Edinburgh. The modern royal train is spartan compared with the luxury of Queen Victoria’s. Lavishly decorated compartments with satin furnishings have given way to carriages which are elegant but plain and functional, with full air-conditioning. The Queen’s saloon has a sitting room, bedroom and bathroom, and a bedroom and bathroom for her dresser. The ceiling panels are white melamine, the main wall finishing is a cream patterned PVC and the furnishings are in shades of blue. Prints of Queen Victoria’s first train journeys were chosen for the Queen’s saloon. Prince Philip’s carriage is slightly smaller, with a kitchen, and a shower instead of a bath. Work on the train began in 1974 and the Queen revisited Wolverton to inspect the completed coaches on 16 May 1977. It is not always appreciated that most special saloons were actually owned by the railway, and the VIP travellers paid to travel in them. The Duke of Sutherland’s coach, built at Wolverton after the first world war in bird’s-eye maple and owned by the Duke, was a masterpiece of Wolverton craftsmanship. Wolverton men were proud of their craftsmanship and this neutral assessment underscores the reason for that pride.